The EPF India is provided the grievance service to raise a complaint through online about EPF India services, the employee or employer can raise a complaint using this service, this is very good service powered by Employees’ Provident Fund Organisation of India. This is a great way to rise a complaint and track status of registered EPF Complaint, the UAN member can resolve their problem with in 30 days of timeline through EPF Grievance, the UAN account holder can submit EPF Complaint online, here we have given simple process to rise your EPF complaint using EPF Grievance. EPF Grievance is an integrated Grievance management system, organised by Employees’ Provident Fund Organisation of India for rise complaints against EPF, the UAN account holder anyone has facing problems can rise EPF Complaint through EPFIGMS for solve issued on EPF withdrawal, or PF Amount transfer or updating of account details or any related EPF India. All the PF holders who have membership at unified member portal can register a EPF Compliant through EPFIGMS portal using their UAN Number, without UAN Number there is no possible to file EPF Complaint and it is mandatory from 1 January 2016 to file EPF Complaint online. The EPFIGMS has provided following services to all EPF India account holders to solve issues related to EPFO and they have assure the problem will solve with in 30 days of complaint register. And there is a facility to send reminder, in case of not resolved the complaint on time, and the EPF Account holders no need to wait and file duplicate complaints against single issue, simple set reminders on your complaint to re intimate about your issue. schemes using UAN Number of EPFO Member. Here is the complete process to file or register a complaint against EPF India Schemes, the employee or employer or EPF Pension holder or any can follow the steps to file EPF Complaint online easily. 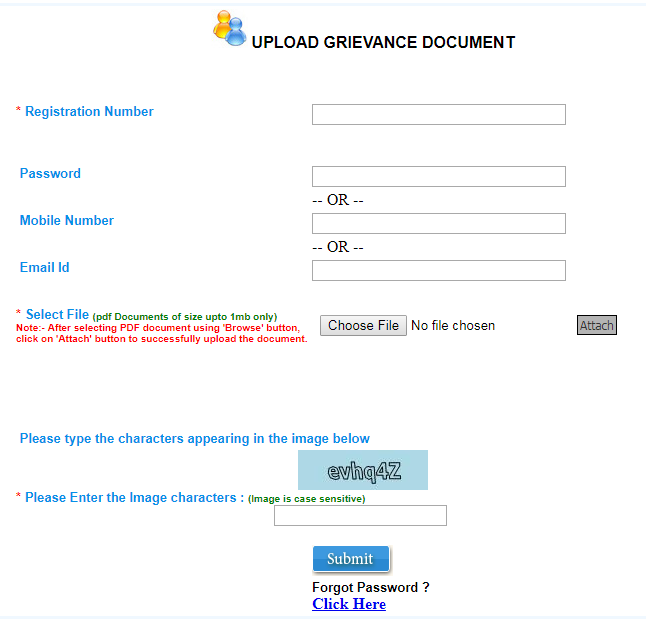 After then you have seen following screen, then select Register Grievance option and proceed to file EPF Complaint as per following image. After proceeding with the “REGISTER GRIEVANCE” option, the user will seen next page with three options of EPF Details, Personal Details, Grievance Details. Now you need to choose EPF Details option and enter all mandatory details as per following. Enter your details at “Please Select Status” like PF Member, EPS Pensioner, Employer or Others. Follow the image for getting more clarity to fill Step-1. Now you need to enter personal details of EPF Account holder, we have given simple steps just follow. Now you can select a categories related to your EPF Complaint and write your issue to clarify of your issue against of EPF Complaint, you can write Grievance Description up to 5000 Characters, it is support to explain with complete details of your issue. 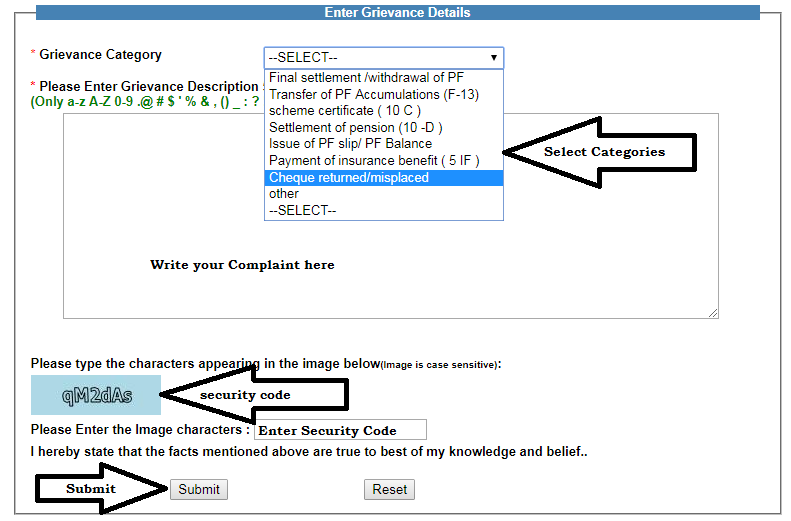 Now enter security code then submit your EPF Complaint online, for complete idea watch below image. After successfully complete above process you will get a confirmation massage on the screen with registered complaint reference ID with grievance loaded EPFO Office details along officer name with phone number and email address of EPF Complaint, for more clarity have a look on the image. 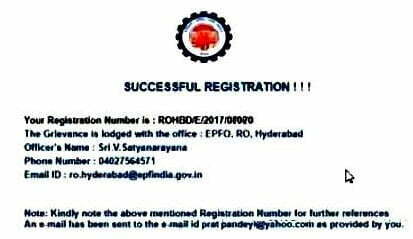 And everyone will get above EPF Complaint details of Reference ID and complete details with confirmation by SMS and email as per your register, follow the image to get email confirmation by EPFiGMS. 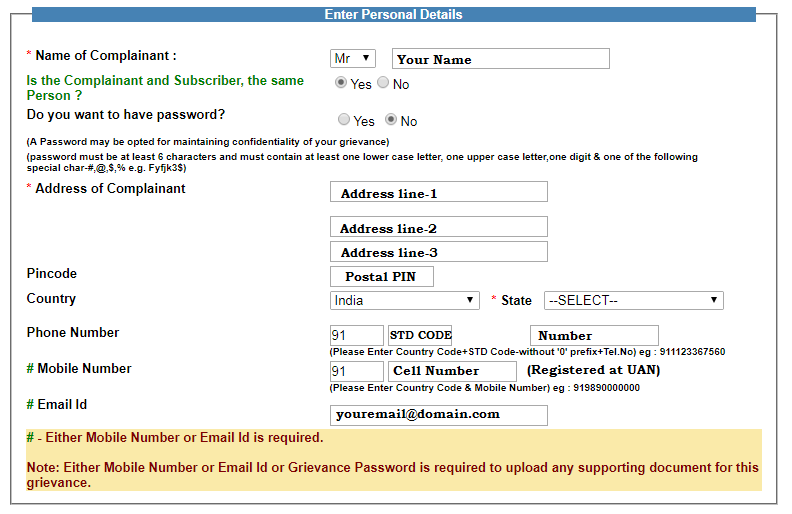 Login with following the link https://epfigms.gov.in/GrievanceDocumentUpload.aspx and watch the image to get clarity. Now you have successfully completed your EPF complaint at EPFIGMS website, now you need to check your complaint status and setup reminder to re rise your complaint if you have not solved.